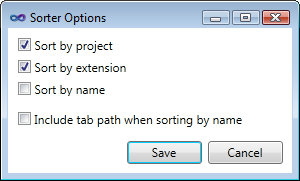 Tabs Studio v2.5.7 released: added the ability to sort tabs by project and extension to the Sorter add-in, fixed tabs reset when Windows theme is changed with Visual Studio 2010 running. Download link: Tabs Studio v2.5.7. A tab can have several extensions. To simplify sorting by extension behavior, only the first extension present on tab creation is used for sorting. You can select the Re-sort tabs context menu command to reset it. The updated Sorter add-in is included in Tabs Studio v2.5.7. Added the Sort including path in the tab name option to the Sorter add-in. Fixed failure to load the AvalonStyleEditor add-in on localized Visual Studio editions. 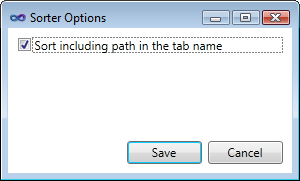 Fixed loss of the previously selected tab state in SSMS when opening a new tab with tab grouping enabled. Removed separate tabs tool window activation each time debugging starts in Visual Studio 2010 and fixed a rare crash when making this window visible. Download link: Tabs Studio v2.5.6. The updated Sorter add-in is included in Tabs Studio v2.5.6.